Its time had come. Like many things in Tofino it was controversial. It isn't perfect but it's here and it's here for all to use. It's the beginning of a new social life in Tofino. From pot lucks to baby groups. Teen dances to hospice meetings. Yoga to wedding receptions. It's warm and friendly. It's connected by a cool trail to the school and the ball fields. It has an awesome kitchen and concession stand. It's affordable. The possibilities are endless. 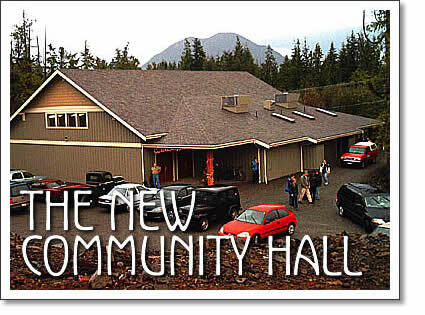 The grand opening party in Tofino on November 9 hosted a vast array of folks from our communities. 400-500 folks as a matter of fact. The feedback was positive and a good time seemed to be had by all. The support in the way of donations has been outstanding. In every way from donations of food for the opening to kitchen appliances and conference chairs the end users are taking ownership and are pitching in. Since the opening we have seen a variety of users. So far a community arts and crafts fair, TFN Christmas party, Fisheries & Oceans symposium, Family Ties mom & baby group and nutrition day, Whale Festival committee meeting and the grade 7 band practices 2 times per week. Coming up we'll see many recreation programs from yoga groups to chocolate making, after school care, wedding receptions, belly dancing class and performance, community pot luck family dinners, birthday parties, suicide prevention seminar and workshop, movies and music… lots of music. There are still some things being worked out and some supplies to be obtained. I keep promising a wish list. We really need kitchen supplies. Plates, bowls, serving utensils, pots and pans, tea towels, pot holders, silverware. A couple of easy chairs, end tables and floor lamps could be useful. Soon a storage shed will be built. At that point we will be asking for volunteers to help build it. Cathy Whitcomb-McDiarmid is a project manager with 'Serves You Right', a Tofino event planning firm.